There's a community champion at all our larger stores, helping make the local area a better place to live and work in. 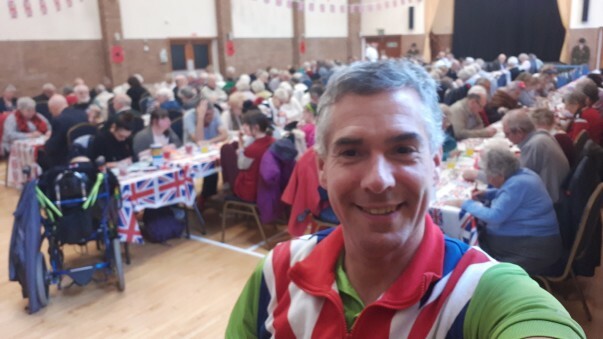 Here, Stephen Bromby from our Boston store writes about the local charities, groups and good causes he's been supporting during the last month. 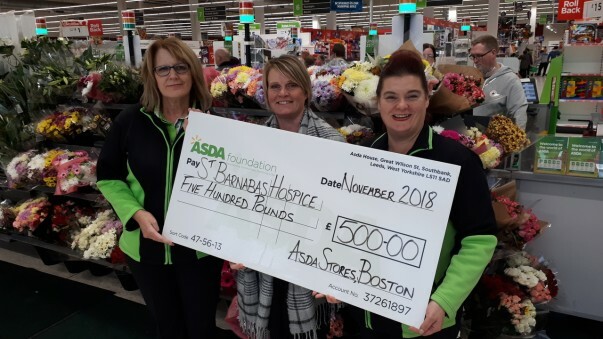 The Asda Foundation has always taken pride in following its maxim to 'transform communities and improve lives' – and never has there been a time in Boston when this was more evident than this month. Throughout the course of November the local community has benefited from over £37,000 of grant funding from Asda's charitable arm. To make it even more special, it coincided with the Asda Foundation celebrating its 30th anniversary. As part of those 30th milestone celebrations Centrepoint Outreach, a charity in Boston dedicated to supporting homeless, vulnerable and lonely people, received a surprise birthday grant of £27,612.40 to replace its delivery vehicle. The van is used every week for many things including delivering furniture to people moving away from homelessness and leaving the local women's refuge. The minimal charge paid to Centrepoint for delivered furniture can help turn an empty property into a homely dwelling as these people begin a new life. Read more here. 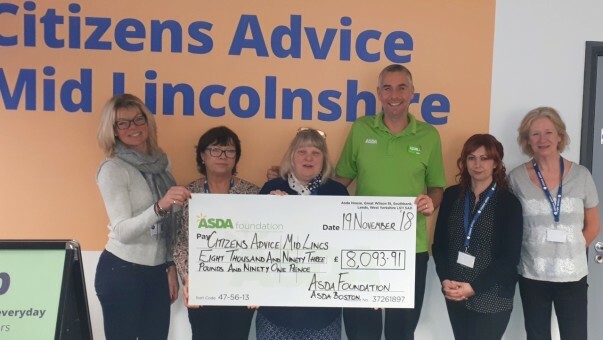 Also in November, Citizens Advice Mid-Lincolnshire received an Asda Foundation Significant Local Community Project grant for £8,093.91. The funding will be used to purchase IT equipment and computers for a community hub following the introduction of Universal Credit in the Boston area. The new social security payment can only be accessed online and the grant will benefit those who are unable to purchase a computer or buy an internet service, and also those who lack the necessary skills to get online. Anybody will be able to use the computers and get help filling in the forms, thanks to the Citizens Advice volunteers and staff. On Friday 9th November the Asda Foundation helped to fund a 'street party' to mark 100 years since the end of the First World War. An £800 Local Impact grant was awarded to Inspire Lincs by Asda Boston earlier this year to purchase food, drink, decorations and entertainment for the event, which brought the village of Old Leake together in its community centre. During the month, another Local Impact grant for £400 was approved for Framework to help make up Christmas hampers for the homeless and a Christmas meal for the residents of the emergency accommodation to enjoy together. Cheques were also issued during the month of November as part of our quarterly Green Token Giving programme. The scheme allows customers to vote for a local cause with a green token every time they shop. Over 5,000 causes across the UK receive a share of over £1.2 million each year through the initiative. Results of the most recent vote at Boston's Lister Way store were: St Barnabas Hospice £500, RoadHoG Youth Bus Project £200, Friends of Tower Road Academy £200. Customers tell us that community matters to them and, to show that Asda cares too, it's great to know that we have the Asda Foundation to support the work that all of our community champions do to get stores and colleagues closer to their local communities. 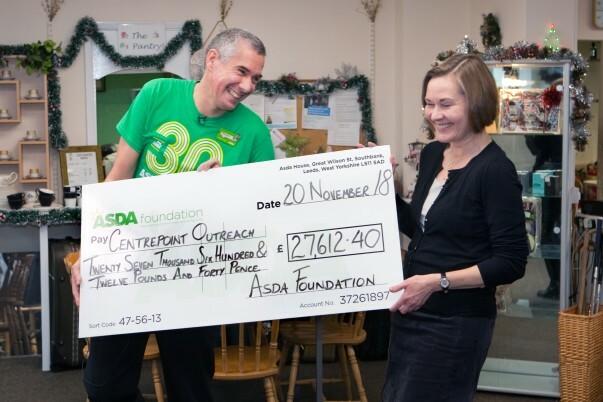 The difference that the Asda Community Programme and the Asda Foundation make to community groups around our store shows that we're listening, building relationships, understand what our customers care about and that we're focused on making an impact to change local lives." Community champions: For more information about the Asda Foundation, please visit www.asdafoundation.org. Find out more about the Asda Community Programme here.